Today’s title comes from a note on my session log. 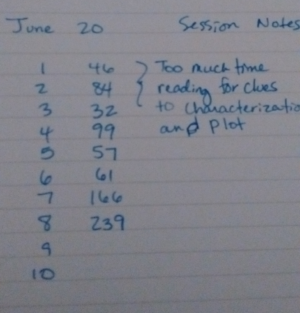 In it, I’m laying the blame for my low word counts in my first three sessions on the fact that I spent a lot of time during them reading through my previous books looking for clues to characterization and plot. Unfortunately, my word counts didn’t improve a lot after I stopped doing that. I don’t record session logs in my spreadsheet—there’s really no room for it—so writing them down seems like a good way to start paying attention to just how often I’m meeting my goal number of sessions. I could put them in OneNote, and I have in the past kept up with sessions in my journals, but I really don’t like that. Also, the logs get kind of lost in the midst of all my ramblings, so… this seemed like something I wanted to try. I’ve devoted one of my favorite notebooks to tracking them and I’m loving how accountable it makes me feel to write down the number of sessions I want to do. I can’t stand the idea of wasting that nice paper, so I’ve felt compelled to fill those slots today! Only two more to go before I call it a day. Also, yesterday I didn’t find time to write a post because I actually got started writing really late and didn’t use timers. I wrote 813 words yesterday—on the wrong book. Okay, so I’m planning to write that book next, so it’s not exactly wrong that I spent time on it, and I admit, I’ve needed a breakthrough for the opening of that book for a good long while and I had one last night, but I really need to finish this other book first so I do feel a little unhappy that I managed to write 813 words but that none of them were for the right book!